AFIRE smart fireplaces – Your decorative ventless fireplace is unique! Fireplaces give the home a soul, a touch of “well-being”. The fire is an invitation to dream. In front of the hearth, the spirit awakens, wanders, remembers… The fire gives us a future, a consciousness. An important fact is that nowadays the art of fire has been lost in the midst of urban life with its excessive demands…. With AFIRE you will discover the decorative smart fireplace. AFIRE offers you the opportunity to create your smart design fireplace in a very simple manner. Modern hearths with real flames that can be installed very quickly, in the city as well as in the countryside, in a house, in an apartment or at commercial premises. An eco-friendly vent-free fireplace which is easy-to-install and easy-to-use. A device for everyday use, simply by pressing a remote control button. How to install your stylish decorative fireplace without flue ? Have you ever seen water burning? Discover the incredible benefits of a 3D water vapor fireplace with real cold flames in adjustable colors. For all locations where hot flames could pose problems, a 3D electric fireplace is the ideal solution. To create a ventless fire space, just install an electronic and remote-controlled ethanol burner insert in a customized décor. With its wide range of bioethanol fireplace inserts, AFIRE offers you endless possibilities to reinvent YOUR world of fire. 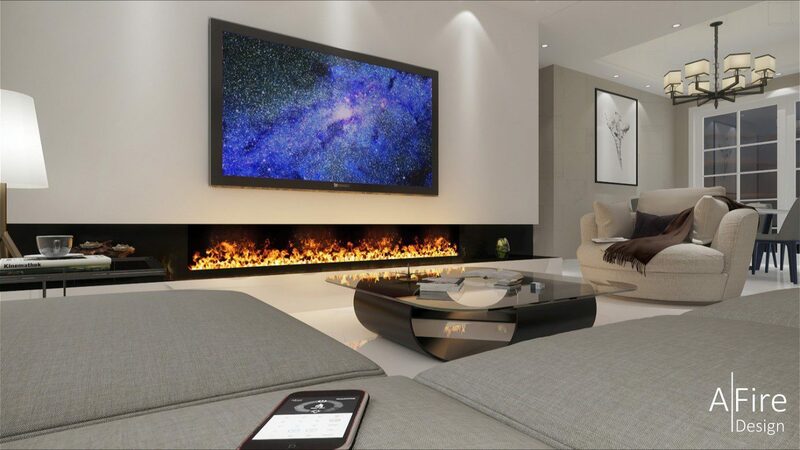 For those who want to install a remote-controlled bio ethanol fireplace without any installation, AFIRE offers a range of electronic fireplaces with remote-controlled automatic ignition. A trendy collection. Light the fire! AFIRE smart decorative fireplace manufacturer creates a new discipline, where art, design and technology intersect, in order to offer you innovative fire spaces. Research, development, production, quality control, everything takes place at our premises. With over thirty years of experience, the manufacturing of intelligent fireplaces, bio ethanol burner inserts and 3D water vapor electric fireplace inserts in a marriage of craftwork and industry is dedicated to safety and design. The contemporary fireplaces have been adapted to the modern urban world. A fire place shapes up the interior decoration. Smart decorative fireplaces are the hot topic nowadays. Fire fits into our current lifestyles. In a world that is increasingly urbanized, modern fireplaces also have high-tech control means. It is environmentally friendly, 100% secure, without constraints of any kind. Designers, architects, decorators, creators… Embrace fire! Banned from cities, complicated or impossible to install, fire spaces were no longer an element of decoration embraced by designers, architects or professionals … But with a changing of the times and with the new arrival of embedded smart inserts, fireplaces have become a lot simpler, and professionals can again consider creating design fireplaces for their customers.